Shortened telomeres can cripple your ability to regenerate tissue. It’s no coincidence that people who are slim and healthy as they age look so much younger. A major component of that is mental: They feel so good, they’re active, they’re engaged, they love life, they have very few limitations. Thus, they wear that happiness and zest for life on their faces. This is why people in their 60’s and 70’s and beyond who are in this group always look 10 years younger. People who are very over-fat are, literally, carrying massive amounts of visceral fat on their bodies all day long. Do you know how hard that is? Do you understand the pressure they are putting on all their bones and joints that have to support that? It’s no wonder over-fat people are more likely to look old and feel worn out. Additionally, when you feel worn out, when you are unhappy with your weight, well . . . it’s no wonder many people let other things go: make up, hair, clothing, socializing, being physically active. With 20 years experience working with overweight and obese people, I can tell you that, for too many, when they lose control of their weight, they often lose control of everything around them; and they certainly don’t try as hard to fight battles. They also very often sleep less and have more stress. Bottom line: When you’re unhappy, it shows. You look older. Why does gaining weight make people look older? Obesity changes blood circulation of the skin leading to obesity-related microangiopathy (small blood vessel disease). Obesity is also associated with changes in collagen structure. Collagen forms the structure of the skin and helps in wound healing. Obesity increases water loss across the skin to a great extent, making it significantly dry (which impairs skin repair after wounds). The strain of bearing excess weight impacts the veins in your legs and can result in varicose veins and rupture of surface capillaries. Secondly, there are structures inside our white blood cells called telomeres, which are the caps at the ends of chromosomes — the molecules that carry genes. Every time a cell divides, telomeres shorten. 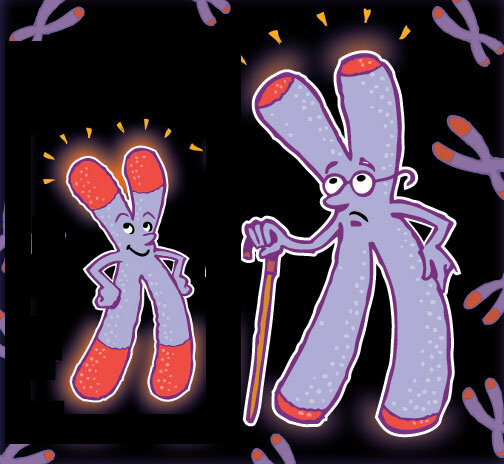 In the natural aging process, telomeres eventually get so short that cells can no longer divide, and they then die. As more and more cells reach the end of their telomeres and die, the inexorable process produces the effects of aging. So, basically, increasing body weight = decreasing telomere length. Of course, rapid, dramatic weight loss achieved in an unhealthy way can also lead to an accelerated process of facial aging. Our diet is what keeps us either slim and healthy or obese and unhealthy, but its impact doesn’t stop there. The food we eat matters to our skin and to our aging almost as much as it does to our waistline.